Exceeding all predictions, the painting “The Sunset over the Great Lavra. 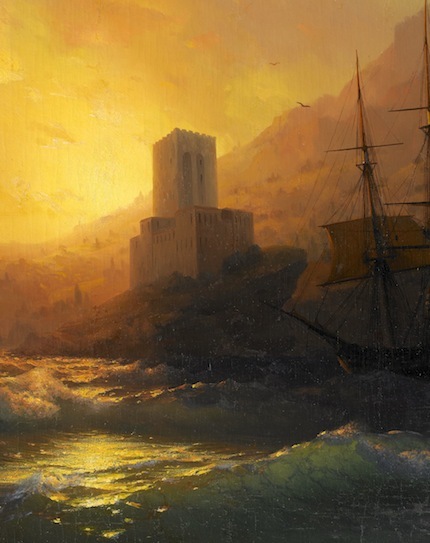 Holy Athos”, by the Russian-Armenian painter, Ivan Aivazovsky (Иван Константинович Айвазовский), was sold for 790 thousand EUR at the auction house Stockholms Auktionsverk, in their December auction, “Fine Art and Antiques”. This early piece is one of the greatest examples of the kind of work by Aivazovsky that has been auctioned off in the last few years. The estimated value of the work of art, painted in 1846, was 452,000 – 678,000 EUR; during the auction, its price quickly escalated to the much higher amount of 790,000 EUR. In the 1950's, one of the painting's previous owners, unaware of its true value, traded it for a dental appointment. For almost half a century, the art work lingered in a small Norwegian village. In the 1990's, upon the death of the dentist, the painting was put up at the village auction, where it was bought by its most recent owner. Experts still have no idea where the painting spent its first hundred years, nor how it came to be in Norway. The painter Ivan Aivazovsky (1817-1900) gained global renown in his early youth as one of Russia's, and Europe's, leading 19th century painters. Today, he is still regarded as the most authentic of the maritime artists. In 1845, Aivazovsky headed to Asia Minor, then later to the Aegean Islands and sunny Istanbul, which the artist visited several times in his life. Quite possibly, it could have been during this first trip to the East that Aivazovsky noticed the peninsula of Mount Athos. But completely unanswerable remains the mystery regarding the woman pictured in the boat – either heading towards, or away from, the mountain monastery of the Great Lavra – since women were not allowed on this holy site. A few years after creating “The Sunset over the Great Lavra. Holy Athos”, Aizvazovsky painted a large-format interpretation of the same landscape, as seen in moonlight. This piece is currently in the national Russian Museum, in St. Petersburg.